A new steam drying technique for wood developed through the EU-funded SteamBio project could significantly reduce transportation costs for biomass, according to the German-based Fraunhofer Institute for Interfacial Engineering and Biotechnology. The technique also yields feedstocks that can be used by the chemical industry. The process is currently being evaluated at the pilot scale. 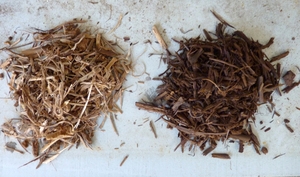 Information released by Fraunhofer IGB Institute explains that forestry waste and other inferior wood is ground into chips, which are an important feedstock for the wood processing industry. Wood chips can also be used as fuel in thermal power plants and woodchip heating systems. However, the high moisture content of wood can casuse problems. Specifically, moisture increases the weight of wood chips, making them more difficult to transport. Fraunhofer IGB also notes that it is difficult to store damp cargo and said that wood chips not protected from rain quickly rot. The SteamBio project aims to overcome these problems through the use of torrefaction. In addition to Fraunhofer IGB, 10 other partners from four European countries participated in the SteamBio project. In a statement released by the Fraunhofer Institute, Siegfried Egner, department head at Fraunhofer IGB and coordinator of the SteamBio project, explains that the technique involves heating biomass in a steam atmosphere without oxygen. “The biomass has three main components—cellulose, lignin and hemicellulose—and this process eliminates the hemicellulose completely,” he said. As a result, the weight of the biomass is reduced while its specific calorific value is improved. The process also makes the material water resistant. Furthermore, the wood chips can be easily ground into a highly reactive powder or compressed into pellets. While terrefaction itself is not a new technique, Bruno Scherer, project engineer at Fraunhofer IGB said the SteamBio project uses a steam drying technology that was developed at Fraunhofer IGB, adapted to work at temperatures between 200 and 250 degrees Celsius. What is unique about the technology is that moisture contained in the biomass and vaporous products of torrefaction are systematically retained in the process chamber and themselves become the process medium. “In other words, we work with superheated steam,” Scherer said in a statement. According to information released by Fraunhofer IGB, the high temperatures used in the process dry out the biomass and result in organic compounds with low boiling points becoming volatile. While the cellulose and lignin remain in a solid state, the volatile substances pas into the gas phase. Special condensers are used to capture these gaseous substances and selectively cook them, recovering them as liquids. 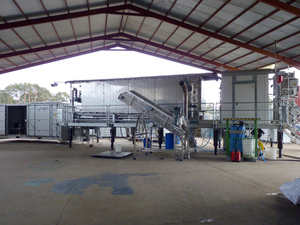 A pilot facility employing the process is currently operating in Spain, taking in pine, oak, beech wood, vineyard prunings and waste from olive oil production as feedstock.